Last time we look at remoting. You can kind of think of clustering as an extension to remoting, as some of the same underlying parts are used. But as we will see clustering is way more powerful (and more fault tolerant too). My hope is by the end of this post that you will know enough about Akka clustering that you would be able to create your own clustered Akka apps. I wanted the demos in this section to be as close to real life as possible. The official akka examples tend to have a single process. Which I personally think is quite confusing when you are trying to deal with quite hard concepts. As such I decided to go with multi process projects to demonstrate things. I do however only have 1 laptop, so they are hosted on the same node, but they are separate processes/JVMs. I am hoping by doing this it will make the learning process easier, as it is closer to what you would do in real life rather than have 1 main method that spawns an entire cluster. You just would not have that in real life. Unlike remoting which is peer to peer, a cluster may constitute many members, which can grow and contract depending on demand/failure. There is also the concept of roles for actors with a cluster, which this post will talk about. You can see how this could be very useful, in fact you could see how this may be used to create a general purpose grid calculation engine such as Apache Spark. Akka has the concept of some initial contact points within the cluster to allow the cluster to bootstrap itself as it were. You may decide if joining to the cluster should be done manually or automatically to configured initial contact points, so-called seed nodes. When a new node is started it sends a message to all seed nodes and then sends join command to the one that answers first. If no one of the seed nodes replied (might not be started yet) it retries this procedure until successful or shutdown. The seed nodes can be started in any order and it is not necessary to have all seed nodes running, but the node configured as the first element in the seed-nodes configuration list must be started when initially starting a cluster, otherwise the other seed-nodes will not become initialized and no other node can join the cluster. The reason for the special first seed node is to avoid forming separated islands when starting from an empty cluster. It is quickest to start all configured seed nodes at the same time (order doesn’t matter), otherwise it can take up to the configured seed-node-timeout until the nodes can join. Once more than two seed nodes have been started it is no problem to shut down the first seed node. If the first seed node is restarted, it will first try to join the other seed nodes in the existing cluster. We will see the entire configuration for the demo app later on this post. For now just be aware that there is a concept of seed nodes and the best way to configure those for the cluster is via configuration. Akka clustering comes with the concept of roles.You may be asking why would we need that? Well its quite simple really, say we have a higher than normal volume of data coming through you akka cluster system, you may want to increase the total processing power of the cluster to deal with this. How do we do that, we spin up more actors within a particular role. The role here may be “backend” that do work designated to them by some other actor say “frontend” role. By using roles we can manage which bits of the cluster get dynamically allocated more/less actors. ClusterEvent.MemberJoined – A new member has joined the cluster and its status has been changed to Joining. ClusterEvent.MemberUp – A new member has joined the cluster and its status has been changed to Up. ClusterEvent.MemberExited – A member is leaving the cluster and its status has been changed to Exiting Note that the node might already have been shutdown when this event is published on another node. ClusterEvent.MemberRemoved – Member completely removed from the cluster. ClusterEvent.UnreachableMember – A member is considered as unreachable, detected by the failure detector of at least one other node. ClusterEvent.ReachableMember – A member is considered as reachable again, after having been unreachable. All nodes that previously detected it as unreachable has detected it as reachable again. What use is a cluster which cant receive commands from the outside world? Well luckily we don’t have to care about that as Akka comes with 2 things that make this otherwise glib situation ok.
An actor system that is not part of the cluster can communicate with actors somewhere in the cluster via this ClusterClient. The client can of course be part of another cluster. It only needs to know the location of one (or more) nodes to use as initial contact points. It will establish a connection to a ClusterReceptionist somewhere in the cluster. It will monitor the connection to the receptionist and establish a new connection if the link goes down. When looking for a new receptionist it uses fresh contact points retrieved from previous establishment, or periodically refreshed contacts, i.e. not necessarily the initial contact points. As mentioned above the ClusterClient makes use of a ClusterReceptionist, but what is that, and how do we make a cluster actor available to the client using that? The ClusterReceptionist is an Akka contrib extension, and must be configured on ALL the nodes that the ClusterClient will need to talk to. The “Official” example as it is, provides a cluster which contains “frontend” and “backend” roles. The “frontend” actors will take a text message and pass it to the register workers (“Backend”s) who will UPPERCASE the message and return to the “frontend”. I have taken this sample and added the ability to use the ClusterClient with it, which works using Future[T] and the ask pattern, such that the ClusterClient will get a response from the cluster request. "Akka Snapshot Repository" at "http://repo.akka.io/snapshots/"
"com.typesafe.akka" %% "akka-contrib"       % "2.4.8"
lazy val root =(project in file(".")). lazy val common = (project in file("common")). lazy val frontend = (project in file("frontend")). lazy val backend = (project in file("backend")). This is the client app that will talk to the cluster (in particular the “frontend” seed node which expected to be running on 127.0.0.1:2551. There is not too much to talk about here, we simply create a standard actor, and send it messages on a recurring schedule. That we use the ClusterClient to send a message to a seed node within the cluster (frontend) in our case. We use the ask pattern which will give use a Future[T] which represents the response. 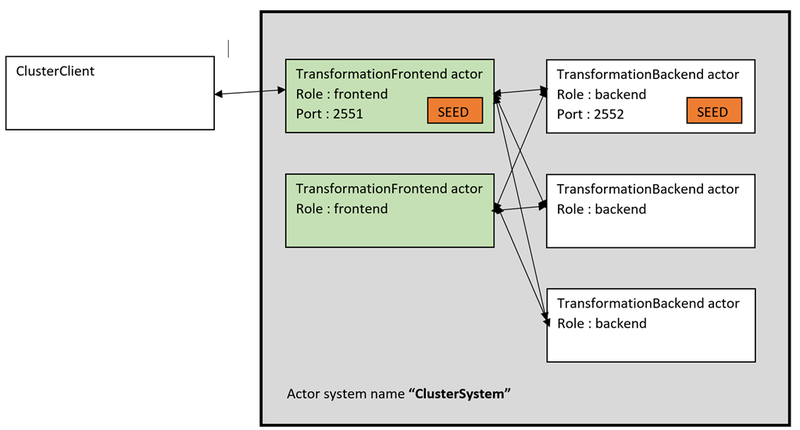 As previously stated the “frontend” role actors serve as the seed nodes for the ClusterClient. There is only one seed node for the frontend which we just saw the client app uses via the ClusterClient. So what happens when the client app uses the frontend actors via the ClusterClient, well its quite simple the client app (once a connection is made to the frontend seed node) send a simple TransformationJob which is a simple message that contains a bit of text that the frontend actor will pass on to one of its registered backend workers for processing. The backend actor (also in the cluster) will simply convert the TransformationJob contained text to UPPERCASE and return it to the frontend actor. The frontend actor will then send this TransformationResult back to the sender which happens to be the ClusterClient. The client app will listen to this (which was done using the ask pattern) and will hook up a callback for the Future[T] and will the send the TransformationResult to the clients own actor. # you may want to use it during development, read more about it in the docs. You can see this is pretty much the same as the frontend, so I won’t speak to this anymore. context.actorSelection(RootActorPath(member.address) / "user" / "frontend") ! And in a nutshell that is how the entire demo hangs together. I hope I have not lost anyone along the way. [INFO] [10/05/2016 07:21:37.229] [ClusterSystem-akka.actor.default-dispatcher-17] [akka://ClusterSystem/deadLetters] Message [akka.cluster.InternalClusterAction$InitJoin$] from Actor[akka://ClusterSystem/system/cluster/core/daemon/firstSeedNodeProcess-1#-2009390233] to Actor[akka://ClusterSystem/deadLetters] was not delivered. dead letters encountered. This logging can be turned off or adjusted with configuration settings ‘akka.log-dead-letters’ and ‘akka.log-dead-letters-during-shutdown’. [INFO] [10/05/2016 07:21:37.232] [ClusterSystem-akka.actor.default-dispatcher-21] [akka://ClusterSystem/system/endpointManager/reliableEndpointWriter-akka.tcp%3A%2F%2FClusterSystem%40127.0.0.1%3A2552-0/endpointWriter] Message [akka.remote.EndpointWriter$AckIdleCheckTimer$] from Actor[akka://ClusterSystem/system/endpointManager/reliableEndpointWriter-akka.tcp%3A%2F%2FClusterSystem%40127.0.0.1%3A2552-0/endpointWriter#-1346529294] to Actor[akka://ClusterSystem/system/endpointManager/reliableEndpointWriter-akka.tcp%3A%2F%2FClusterSystem%40127.0.0.1%3A2552-0/endpointWriter#-1346529294] was not delivered. dead letters encountered. This logging can be turned off or adjusted with configuration settings ‘akka.log-dead-letters’ and ‘akka.log-dead-letters-during-shutdown’. [INFO] [10/05/2016 07:21:38.085] [ClusterSystem-akka.actor.default-dispatcher-22] [akka://ClusterSystem/deadLetters] Message [akka.cluster.InternalClusterAction$InitJoin$] from Actor[akka://ClusterSystem/system/cluster/core/daemon/firstSeedNodeProcess-1#-2009390233] to Actor[akka://ClusterSystem/deadLetters] was not delivered. dead letters encountered. This logging can be turned off or adjusted with configuration settings ‘akka.log-dead-letters’ and ‘akka.log-dead-letters-during-shutdown’. [INFO] [10/05/2016 07:21:39.088] [ClusterSystem-akka.actor.default-dispatcher-14] [akka://ClusterSystem/deadLetters] Message [akka.cluster.InternalClusterAction$InitJoin$] from Actor[akka://ClusterSystem/system/cluster/core/daemon/firstSeedNodeProcess-1#-2009390233] to Actor[akka://ClusterSystem/deadLetters] was not delivered. dead letters encountered. This logging can be turned off or adjusted with configuration settings ‘akka.log-dead-letters’ and ‘akka.log-dead-letters-during-shutdown’. [INFO] [10/05/2016 07:21:40.065] [ClusterSystem-akka.actor.default-dispatcher-20] [akka://ClusterSystem/deadLetters] Message [akka.cluster.InternalClusterAction$InitJoin$] from Actor[akka://ClusterSystem/system/cluster/core/daemon/firstSeedNodeProcess-1#-2009390233] to Actor[akka://ClusterSystem/deadLetters] was not delivered. dead letters encountered. This logging can be turned off or adjusted with configuration settings ‘akka.log-dead-letters’ and ‘akka.log-dead-letters-during-shutdown’. Where Can I Find The Code Examples? It has been a while since I wrote a post, the reason for this is actually this post. I would consider remoting/clustering to be some of the more advanced stuff you could do with Akka. That said this and the next post will outline all of this good stuff for you, and by the end of this post I would hope to have demonstrated enough for you guys to go off and write Akka remoting/clustered apps. I have decided to split the remoting and clustering stuff into 2 posts, to make it more focused and digestible. I think this is the right thing to do. If you have ever used RMI in Java or Remoting/WCF in C# you can kind of think of Akka remoting as something similar to that. Where there is the ability to call a remote objects method as is it were local. It is essentially peer-to-peer. Obviously in Akkas case the remote object is actually an Actor, and you will not actually be calling a method at all,but will instead by treating the remote actor just like any other actor where you simply pass messages to it, and the remote actor will work just like any other actor where it will receive the message and act on it accordingly. In Akka there is literally no change in coding style to work with remoting, it is completely configuration driven. This is quite nice. As I have stated on numerous occasions I have chosen to use SBT. As such this is my SBT file dependencies section for both these Remoting examples. "com.typesafe.akka" %% "akka-remote" % "2.4.8"
As stated above “Remote Selection” will try and use actorSelection to look up a remote actor. The remote actor IS expected to be available and running. lazy val remote = (project in file("remote")). lazy val local = (project in file("local")). This simply creates 2 projects for us, Remote and Local. Now that we have the relevant projects in place, lets talk about how we expose a remote actor for selection. We must ensure that the remote actor is available for selection, which requires the use of an IP address and a port. Ok so now we have the ability to expose the remote actor on a IP address and port, lets have a look at the remote actor code. sender ! "Hello from the RemoteActor"
remoteActor ! "The RemoteActor is alive"
And that is all there is to the remote side of the “remote selection” remoting version. Lets now turn our attention to the local side. So far we have a remote actor which is configured to up and running at 127.0.0.1:4444. We now need to open up the local side of things. This is done using the following configuration.Notice the port is a different port from the already in use 4444. Obviously if you host these actors on physically different boxes there would be nothing to stop you using port 4444 again, but from a sanity point of view, I find it is better to not do that. We can make use of plain old actor selection to select any actor by a path of our chosing. Where we may use the resolveOne (if we expect to only match one actor, remember we can use wildcards so there are times we may match more than one) to give us a ActorRef. When we use resolveOne() we would get a Future[ActorRef] that we can use in any of the normal ways we would handle and work with Futute[T]. I have chosen to use a for comprehension to capture the result of the ActorRef of the more actor. I also monitor the remote actor using context.watch such that if it terminates we will see a Terminated message and can shutdown the local actor system. We also make use of the become (see the state machines post for more info on that) to swap out the message loop for the local actor, so work differently once we have a remote ActorRef. Once we have an ActorRef representing the remote actor it is pretty standard stuff where we just send messages to the remote actor ref using the ActorRef that represents it. Here is the entire code for the plain actor selection approach of dealing with a remote actor. actor ! "Hello from the LocalActorUsingPlainSelection"
sender ! "Hello back to you"
Another approach that can be taken rather than relying on straight actor selection is by using some special Akka messages, namely Identify and ActorIdentity. The idea is that we still use actorSelection for a given path, but rather than using resolveOne we sent the send the ActorSelection a special Identify message. The actor that was chosen by the ActorSelection should see this Identify message and should respond with a ActorIdentity message. As this point the local actor can simply listen for ActorIdentity messages and when it sees one, it can test this messages correlationId to see if it matches the requested path, if it does you know that is the correct actor and you can then use the ActorRef of the ActorIdentity message. As in the previous example we also make use of the become (see the state machines post for more info on that) to swap out the message loop for the local actor, so work differently once we have a remote ActorRef. actor ! "Hello from the LocalActorUsingIdentity"
Just as we did with remote selection, remote creation shall be split into a remote project and a local project, however since this time the local project must know about the type of the more actor to create it in the first place we introduce a common project which both the remote and local depend on. It can be seen that both the local/remote will aggregate/depend on the common project. This is standard SBT stuff so I will not go into that. So now that we understand a bit more about the SBT side of things lets focus on the remote side of things. This may seem odd since we are expecting the local actor to create the remote aren’t we? Well yes we are but the remote actor system must still be available prior to start/deploy and actor in it via the local system. So it still makes sense to examine the remote side of things first. Now that we have the relevant projects in place, lets talk about how we expose a remote actor for creation. We must ensure that the remote system is available for creation requests, which requires the use of an IP address and a port. All that is happening here is that the remote actor system gets created. Most of the hard work is done in this project. As it is the local side of things that is responsible for creating and deploying the remote actor in the remote actor system, before it can then make use of it. Lets start with the deployment of the remote actor from the local side. It can be seen that the first thing we try and do is try and create the remote actor (CreationActor) using the config above. If this all works we will end up with a CreationActor being created in the already running remote actor system. This CreationActor can then be used just like any other actor. So we now have a complete pipeline.